In January 2009, while combing through Bob’s archives, searching for just the right items to bring to Winter NAMM for our small showcase previewing our upcoming exhibit, Waves of Inspiration: The Legacy of Moog, I came upon a light blue folder with several pockets loaded with documents  letters, schematics and notes. The upper right hand corner of the cover of the folderwas simply marked Brand. Inside was a treasure trove of information, much of it coming from meticulously written and technically detailed letters written on translucent typing paper with the name Max Brand printed in the top margin, with dates beginning as early as March 1966. A slew of schematics in Bob’s hand were interspersed among these letters, as well as notes describing specifications for what would become known at the Moogtonium, and in some circles, the Max Brand synthesizer. Max Brand, was an Austrian avant-garde composer living in New York City, was searching for someone to build him a version of a Trautonium, an early electronic musical instrument invented in 1929 by Friedrich Trautwein and later perfected by Oskar Sala. Sala’s instrument, the Mixture Tratonium, was famous for its subharmonic oscillators and ribbon controller interface (instead of a keyboard). You can read more about the instrument here and see a fantastic video of Sala playing the instrument here. It was Sala’s version that interested Max Brand. Brand learned of Bob Moog’s early work in creating synthesizer modules, and contacted him about building a version of this rare instrument. Bob, still in the early phases of developing the Moog modulars, agreed. The two men worked for two years to develop the instrument, with Bob building and Brand honing needed specifications and capabilities. The instrument was ultimately delivered in 1968. In the year since the initial discovery of the Moogtonium documentation, I shared the collection of notes and schematics with a few trusted industry gurus, who agreed that this was indeed an important discovery, as it demonstrates the variety of work that Bob took on outside of the world of his more well-known creations. Ever the toolmaker, he was intrigued and inspired by new projects. It was our archive historian and investigator extraordinaire Brian Kehew who discovered a group of musicians from the Austrian record label and platform Moozak who have been followers and fans of Max Brand. Incredibly, they had recently gained access to the Max Brand Archives in Austria, and to the Moogtonium or Max Brand synthesizer as they commonly refer to it. Brian began a correspondence with Clemens Hausch, one of the members of Moozak, only to find out that the group was in the midst of producing a CD with music composed on the Moogtonium. Clemens has generously shared information from the Brand archives, thanks to the support of Dr. Helmuth Schwarzjirg who is in charge of the Max Brand archives. Together we have pieced together what must have transpired between the musician and the toolmaker in this instance. Below, you will find a more detailed history of Max Brand and the Moogtonium, written by Clemens. In August, Moozak released Kabelbrand: Sounds from the Max Brand Synthesizer. This CD of experimental music composed for this custom instrument includes both the music of Moozak resident artists (Clemens Hausch, Benedikt Guschlbauer, Gerald Krist and Uli Kühn) and, thanks to the support of Dr. Schwarzjirg, of Max Brand himself. This is one of the very few times that Max Brand’s music has been made available for distribution and the first time other musicians have performed on this prototype instrument. Moozak has generously donated 25 of these CDs to the Bob Moog Foundation and they are now available as a gift with a $30 donation here. “I discovered Max Brand and his music just this year, through our connection with Clemens and Dr. Schwarzjirg. I’m actually a fan of experimental music, but I’d never heard of him before. If you’re a synth fan (especially Moog modular) and enjoy creating unique experimental sounds, you may also be pleased to discover Max Brand. His music is really exceptional, but almost unknown ’til now. musical; you can hear his orchestral ideas in the parts he writes. He’s not just fiddling with oscillators, but writing and recording parts that fit together, they answer each other, contrast and move. There is no imitation of acoustic sounds – these are weird and wonderful patchworks of tone and pitch. There’s lots to hear, if you’re into sound exploration. Many thanks to Brian, Clemens and Dr. Schwarzjirg for the collaborative spirit they have all shared in exploring this fascinating story. In the coming months, we will continue to share more information and documentation about the Moogtonium and the collaboration between Bob Moog and Max Brand as we uncover and are able to interpret it. Please check our website for new blog posts on the subject! As indicated by his early manuscripts from 1946, Brand imagined an electronic keyboard instrument that was capable of imitating the sounds of a piano. Within a decade, he had realized that new instrument technology demanded a new musical language; he understood that the pure imitation of conventional instruments was foolish. At the time, most early synthesizers were located at universities and research facilities. Brand was a big admirer of electronic music, but had no personal connections to these hallowed halls, so he had no access to these machines and studios. He was a difficult character at times; we know from his biography that he lived quite isolated socially as well as artistically. By the mid 1950s, he had decided to build a personal studio to create electronic music. In a letter from 1955, Brand asks German composer Herbert Eimert for advice on the matter. Eimert describes various techniques to Brand, such as tape-cutting and layering of sine waves and sends him some tapes with contemporary electronic music. Equipped with this (and later with the help of his friend Fredrick Cochran) he started building his studio. There is little information left about this early experimental electronic phase of Brand’s life, though there are some electronic pieces as early as 1958. Some of his early tracks are incredibly advanced, such as the short piece Notturno Basilerio; which could easily translate as a late 70s industrial music track. Other pieces, like the French Folk Songs carry a naïve romantic feeling. Technicians would design Brand circuits to his specifications, but he sometimes lacked skilled people around him (or an ability to get along with them) he often had to solder the circuits himself. Although he developed sufficient skills to build his first studio alone, he did not achieve the sounds that he wanted and he lacked sufficient knowledge to build the more complex designs he envisioned. However, technical advancements were happening, and by the early 1960s new solid-state synthesizer designs showed up, cheaper and smaller than the room-filling machines at universities. Max Brand eventually met Bob Moog, who was working in upstate New York. How Brand met Moog is not documented, but there are some letters that indicate that Herbert Deutsch visited Brand in his studio in 1964, so he probably put Brand into contact with Moog. Moog, by then, was still in the phase before his commercial breakthrough, and in 1965 happily accepted to build the instrument, according to Brands close specifications. Brand even supplied Moog with the original patent papers of Oskar Sala, but Moog, afraid of violating Sala’s design rights, pursued his own methods to imitate the workings of the Trautonium. Design and delivery of the new instrument was estimated to be a few months but, in reality, it took almost 2 years to complete. It may have been the difficulty of designing much of the instrument from the ground up or the growing popularity of Moog’s instruments that caused the delay. Finally after much prodding from Brand, in 1968 Moog delivered the first version of the instrument (now called the Moogtonium). Brand had very strict ideas of how the instrument should work, so he continued to ask for further modifications and repeatedly sent it back to Moog to have these changes performed, which ultimately lead to their split. Although Brand kept on working and continued to produced electronic pieces exclusively on Moog’s machine (serviced by Frederic Chochran after Brand’s and Moog’s split), he did not achieve the desired success and deserved respect. He produced some very diverse and skillful pieces, like the ballet ilian 4, but failed to reach his audience, as these electronic pieces never left his studio. In 1973 “Maschinist Hopkins” was to be performed in Austria. Brand saw a chance for recognition and decided to move back to Austria. However, the opera was performed only once, and in a shortened form. Success alluded him, and Brands equipment suffered damage during the trip back to Austria: The synthesizer was transported by ship, left in a leaky cargo container in the harbor of Hamburg for many months. Water entered, and damaged the machine severely. Afterward, it was finally restored and installed in his new home in Langenzersdorf, a small village near Vienna (where the Brand Archive is located today). The change from U.S. to European electrical standards (60Hz to 50Hz) turned out to be the next problem. Brand found competent technical support from Hans Wolf and Dieter Kaufmann, but it took 3 years to return the system back to its original state. When the machine was ready again, Brand was 82 years old, and his health had faded. He started to suffer from dementia and though he had still clear moments, he destroyed a lot of his own work unintentionally; in his weak moments he confused tapes and boxes, overwriting finished pieces, eventually destroying most of his work. There is still a vast tape collection in the Max Brand Archive, but it’s almost impossible to identify what is meant to be a finished piece from the sketches and accidents. Brand died in 1980, and his wife died 5 years later. In his will, he directed that his inheritance be used to support younger artists, thus the Max Brand Prize was founded (given away until 2003). The Moogtonium, just as Max Brand left it, is a patchwork of parts from different eras, and no longer one complete conceptual instrument. For Bob Moog, it was a memorable (if difficult) project, and one of the very few synthesizers he kept full notes on. The Moogtonium has totally unique custom-built features, and it can create sounds unheard on any other Moog synthesizer. Today, it sits as unfinished and full of promise as the life and career of Max Brand. It is a rather unique piece of synthesizer history, a special instrument finally being heard publicly for the first time. The machine is unique in various respects, since it was built to order, and has a good percentage of prototype modules. The Moogtonium was built as two monophonic synthesizers, arranged in a symmetrical fashion. It is controlled by two keyboards, each with a ribbon/linear controller above. Each keyboard and ribbon control one side of the machine; providing a duo-phonic machine overall. The heart of the Moogtonium is two subharmonic oscillators which can synthesize a basic frequency, as well as 4 additional partials, generated by dividing the base frequency harmonically. Though functionally similar to the Mixtur-Trautonium, its circuitry was a unique design by Bob Moog. 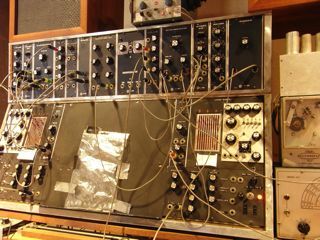 There is an array of standard and not-standard Moog modules above the main sound generating area of the machine. This is an important aspect that makes the machine different from the Mixtur-Trautonium, as Sala’s machine did not have any modular-patching capabilities. Brand was an outsider, and both a revolutionary and a conservative. His work is mostly forgotten these days, which is a pity since he was a true innovator in some respects. His desire for more holistic sound and light experiences is evident in unfinished cabinet parts that were made to contain a light organ. His 1960 piece “The Astronauts” was intended to be an audio-video piece, with film sequences, light effects and so on. At his heart, he always stayed an opera composer, and continued to prepare operatic pieces. He developed an additional interest in the new technological possibilities of film. In early texts, Brand demands a more immersive opera, equipped with light effects, nonmusical sound instruments and movable stage parts. Throughout his life he repeatedly wrote theoretical texts about the implications of technology in music and society. Later he proposes the ideas of electronic music as music that is NOT dependent on the performer; it can be recorded once, then played everywhere – by everybody; music without elitist concert halls and interfering conductors and directors. This concept became popular much later in the 1980s when electronic equipment became inexpensive, and everybody could become a home producer. Max was a revolutionary, though a strange and largely unheard one. In 1999 the Phonotaktik festival in Vienna paid tribute to him, and a cd with some pieces by him as well as some remixes was released on the Rhiz Label. Later, throughout 2009, the Moogtonium synthesizer was featured in an exhibition in the IMA Institute in Hainburg, near Vienna. Later, it was demonstrated at the Ars Electronica festival in Linz, Austria  one of the oldest and most famous festivals for electronic art and music worldwide. Out of these exhibits emerged a new awareness of the instrument, and produced a new musical release – Kabelbrand. 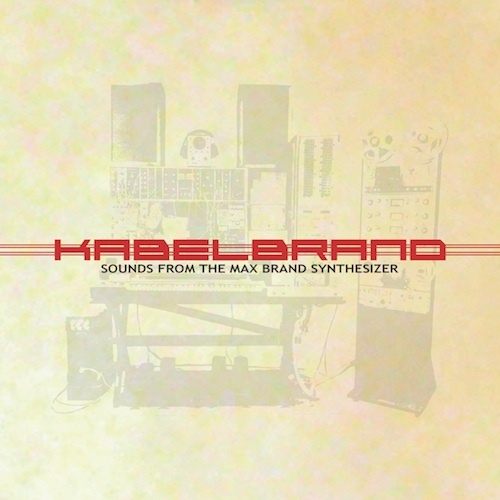 The disc Kabelbrand  Sounds from the Max Brand Synthesizer is the first use of this incredible synthesizer since Brand’s death. The CD is released by the Austrian record label Moozak; a label dedicated to experimental/new music. In January 2009, Clemens Hausch, Benedikt Guschlbauer, Gerald Krist and Ulrich Kühn played an improvisational live concert on the Moogtonium  its first live concert. Playing a concert on the instrument was an incredible experience, and the artists decided to create a CD with their music – as well as the forgotten music by Max Brand. Tryptich and Ilian 4 were produced entirely on the current Moogtonium synthesizer. Triptych was composed by Brand in 1970. Ilian 4 is a ballet composed in 1974, when Brand was at the remarkable age of 78. Ilian 4 was inspired by Robert Graves book The Greek Myths, and is the last preserved piece Brand completed in his life. I am working at the Vienna Museum of Technology on electronic musical instruments. In that context I am interested in any material about the Max Brand synthesizer (I know the Austrian materiai). Are there additional documents at the Moog archives related to Max Band? Is it possible to get copies?